Now THERE’S a phrase you wouldn’t normally expect to read, with the possible exception of the “Local Crime” section of the Washington Post. But it’s true. The Kennedy Center, like so many other cultural institutions, is having a hard time attracting young audiences. 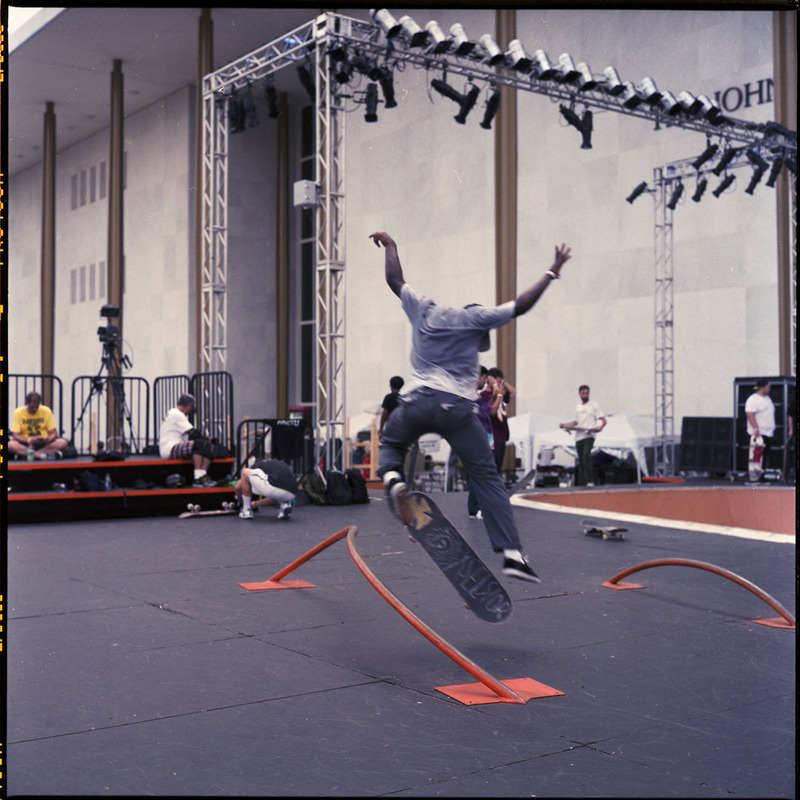 In a bid to outreach, they set up a skate park on the front terrace and invited local skateboarders to come and perform, and tossed in a stage for live bands. This was one instance (of many) where having my Rolleiflex was a huge advantage. 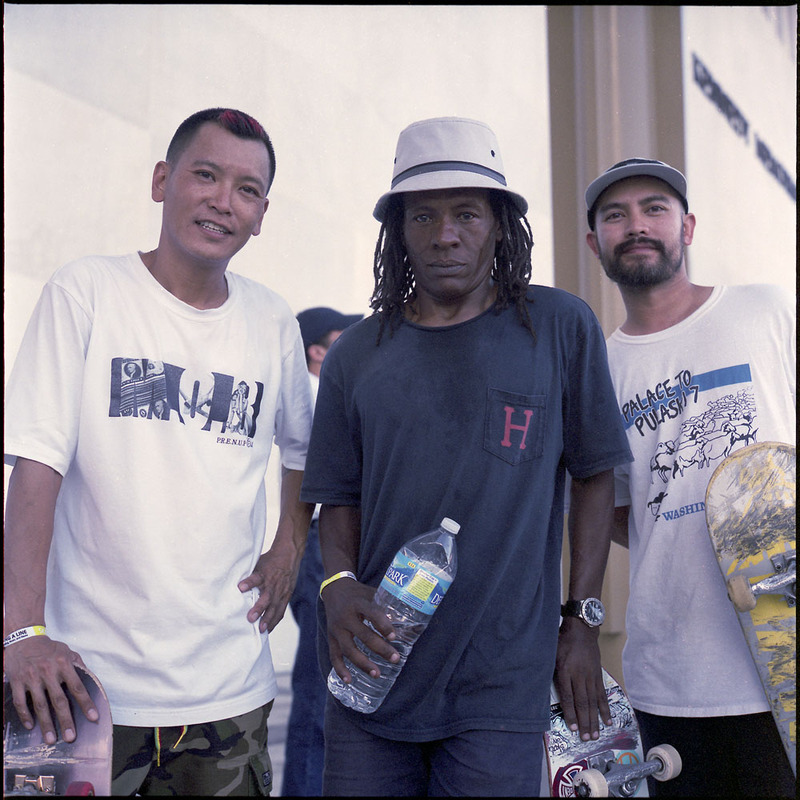 It gave me an entree to talk to the skaters and ask for portraits. Everyone loved the camera and if I asked, they posed willingly. On the few action shots I took, it also helped by having no mirror blackout at the moment of exposure, so I could see exactly when I was pressing the shutter button, like in this shot above. 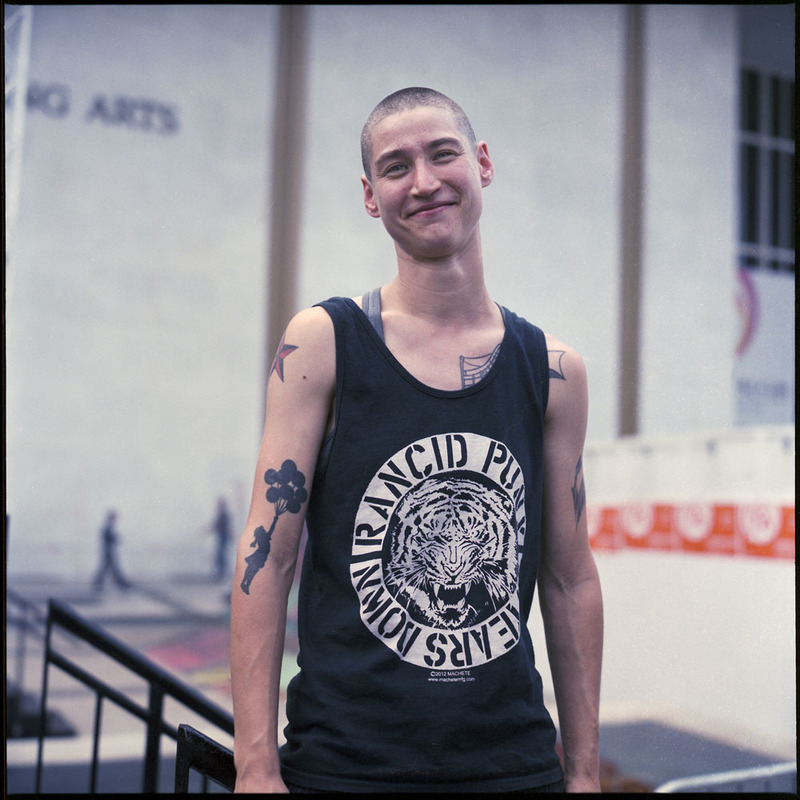 I initially approached the asian skater about taking his picture. He pulled in his friends and all of them posed together. I was surprised at how willing they were to pose, as I mostly shoot candid street photos and people don’t always appreciate that. I don’t know what it was about that day but everyone was just so natural in their posing, it all worked out so well and I didn’t have to direct anyone. This was a fun shot to take, as I was anticipating this kind of motion blur, but couldn’t know what exactly to expect because the eye doesn’t see motion blur at 1/30th of a second. But I knew I got the skateboarder in the right place. This girl was working the lights at the event. She saw my camera and asked about it, so we chatted for a couple of minutes about the event, the folks skating, and the weather (it was scorching hot that day, and inside the light tent had to be even hotter). I asked for her picture and she immediately said yes, and even suggested the backdrop instead of inside the lighting tent. 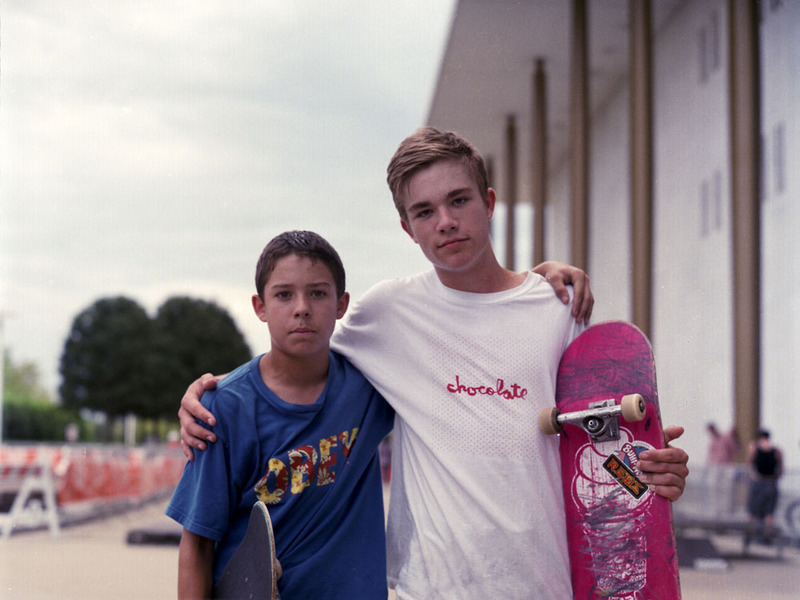 The kid in the white shirt saw my Rollei, and asked some questions about it, and was very excited by it. Again, I asked for a photo before he started his next run, and he pulled his buddy over, they wrapped their arms around each other, and posed. All on their own, no direction from me. 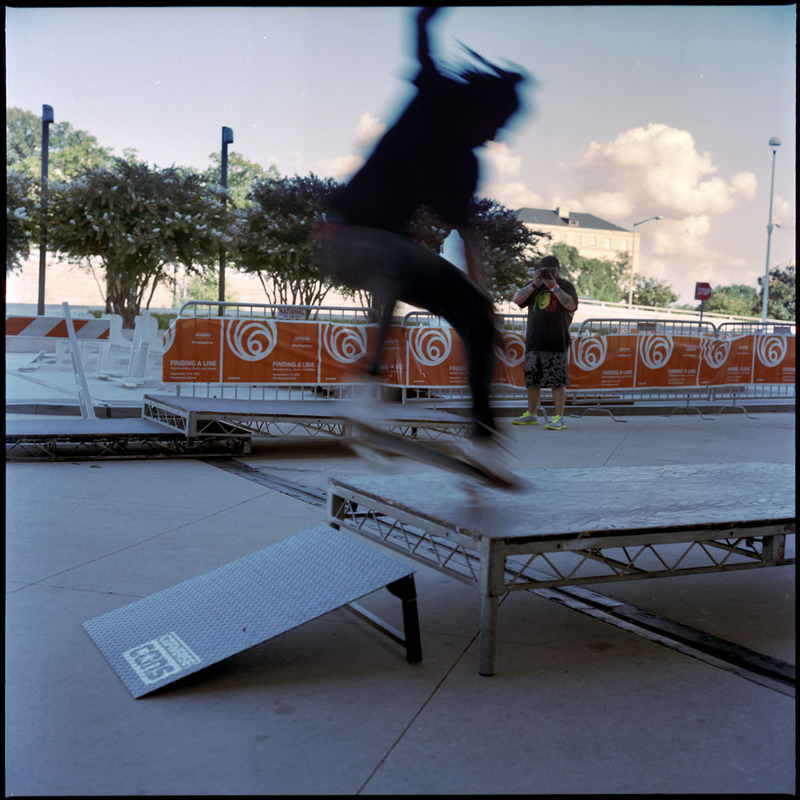 I was very chuffed to see how the shot turned out, as I was shooting on the run as it were – one of the docents for the event had earlier shooed me off from the spot where I was standing to take the picture because it was in the path of potentially out-of-control skateboards.